What’s the weakest part of your studio game? Your teachers? Your desk staff? Your workshops and events? Your Trainings? How about your prop storage area? Piled blankets, sloppy mats, tangled straps, leaning block towers… Save the block tower! This isn’t helping your students relax and enjoy yoga at your studio. 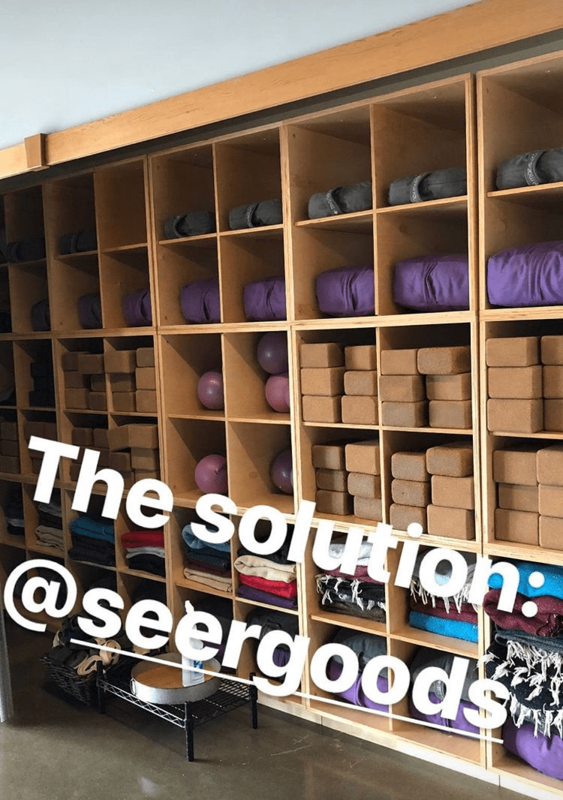 This summer, Seer Goods built us an organizational system to house our blankets, blocks, bolsters, Danda™ staffs, Apex™ weights… After years of watching our students struggling in the chaos in our closet, we knew we had some room for improvement; which is a good thing. What we didn’t know was how to design and build the solution. Seer Goods does that. They even built out logo into the design. And they did it without overdoing it. They did it with class. The process is simple, efficient, and even enjoyable! Seer Goods will design your prop storage specifically for your space and the props that go in it. The result is a smooth, user-friendly, zen-enhancing, prop storage for your yoga students. Now our students tell us all the time how much they appreciate the ease and thoughtfulness of the prop storage area. We’re happy customers because we HAVE happy customers. So, we’re happy to pass the word onto you. Take a look at their site and connect with them. They’ll get you all straightened out.